Orthodox economic theory does not acknowledge the amply documented fact that financial actors can not only influence but actually manipulate the market, make it move in a particular direction…. Economic theory does not address the structural causes of economic collapse…. We are not dealing with a cyclical process; what is at stake is a major dislocation in the financial, trading and productive structures of the global economy. –Michel Chossudovsky, The Global Economic Crisis, p16 (emphasis in original). Earlier this summer, I was invited to attend a brown bag lunch in Berkeley, California, hosted by the Sustainable Economies Law Center. SELC helps urban farmers, worker-owned co-ops, and other social enterprises sort through legal gray areas. The lunch was a discussion about money that had a diverse group of participants who wished to do various things such as “reboot” the financial system, promote individual investments in local food systems (Slow Money Alliance) or abolish monetary systems altogether (The End of Money, my contribution to the discussion). Although most of the discussion was focused on the future, one man was concerned with teaching people how the current system worked. As he made his point, I drew from my bag a copy of The Global Economic Crisis, and soon was telling the group that this book would do just what that gentleman had just said needed to be done. But this is not a ordinary book on financial literacy that will tell people about the differences between banks and credit unions, the role credit scores play in our personal lives, or how to access small business financing. This book is a compilation of essays by some of the most socially conscious political and economic minds of our time, including James Petras, Bartle Professor (Emeritus) of Sociology at Binghamton University, New York, and the author of more than 60 books published in 29 languages, Peter Phillips, Professor of Sociology at California State University—Sonoma and director of the Project Censored Awards program, Peter Dale Scott, a former Canadian diplomat and English Professor at the University of California—Berkeley, and renowned researcher of the New World Order, Ellen Brown, author of the best selling book Web of Debt, which examines the inner workings of the Federal Reserve, and Mike Whitney, an independent writer in Washington State, who analyzes the inner workings of Wall Street. . The Global Economic Crisis describes the big picture, the global macroeconomics that translate into high unemployment, massive foreclosures, drastic cuts in local governmental services, and bankruptcy for millions of individuals, and businesses large and small, worldwide. And the understanding of economics at the global level, not how to open a checking account or how to shop for an auto loan, is the financial literacy the public needs most. The book, which is divided to five parts, starts with a 58-page history lesson by editor Michel Chossudovsky, professor emeritus in economics at the University of Ottawa. 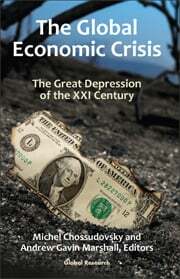 The essay explains why the global economy is in the dire shape it is in now, and who is responsible. That essay alone is worth the price of the book because it makes clear that any notion of an “invisible hand” that guides the marketplace to equilibrium in the absence of government interference by taxation and regulation is a myth. Any invisible hands in the marketplace bear the fingerprints of the big investment banks, merchant banks and hedge fund managers, and they have their thumbs on the scale. The description of the current situation continues in Parts IV and V, titled The Global Monetary System and The Shadow Banking System, respectively. Read Ellen Brown’s essay “Wall Street’s Ponzi Scheme” and Mike Whitney’s essay “Securitization: the Biggest Rip-Off Ever” that close the book and you will be hoping, if you don’t already, that orange jumpsuits become the new fashion statement among the financial elite. Chossudovsky and Phillips take on the subjects of the global economy, poverty and social inequality in Part II. Six authors take up the interconnection between the current global economy and “War, National Security and World Government” in Part III. In total there are 20 essays in this book, each with end-notes and if necessary, graphs, tables and sidebars to bring home the point: The world’s real economies, and with them the quality of our lives and environment, are being destroyed by the handful of people and institutions running the Wall Street casino. Yet The Global Economic Crisis doesn’t read like a dry textbook. My biggest problem in reading it on the train ride I most frequently made between Oakland and Berkeley, California, was that the ride was too short to let me settle in with the book. The Global Economic Crisis should be translated into all languages, be made the standard textbook in all introductory economics classes, and be available in all libraries and bookstores. Young people, especially, should read it as soon as they are able to understand the concepts. The Global Economic Crisis is THE most important book of our time because it teaches us how the current global financial system works, and that knowledge will serve as the impetus for the major changes we need to build just, peaceful and prosperous societies on an ecologically flourishing planet. Kéllia Ramares is a freelance journalist in Oakland, CA. She is currently working on a book called “The End of Money: A Critique of Paying, Owing and Working “for a Living.” She can be reached at theendofmoney [at] gmail.com. Global Research Publishers, Montreal, 2010.